What are you doing this Friday evening? Before you start plotting out your weekend birding strategy, consider joining Richard Crossley and Brian Sullivan for Raptor ID Happy Hour, a conversation about North American raptors, at 6pm tonight, March 22nd. 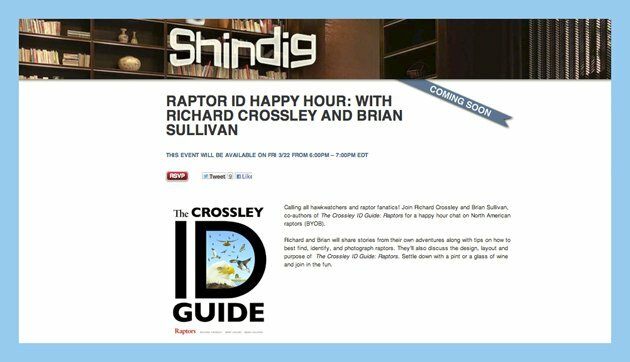 Crossley and Sullivan are the co-authors of The Crossley ID Guide: Raptors, published this week by Princeton University Press. You may remember Mike’s post What is a Black Hawk? that kicked off the Raptor Blog Tour celebrating the book’s publication. Well, Princeton University Press has also been offering an ultimate Sweepstakes prize (enter NOW! ), and this live happy hour web event. We are promised that Richard and Brian will share their raptor identification and photography secrets and discuss the design, layout and purpose of their latest photographic guide. So, bring your own spirits, emotional and liquid, and be a part of this unique web event! Sorry to miss your ID happy hour on Mar 22. You posted this on Mar 22. Too late for me to make arrangements to participate. Is that your usual protocol to announce so closed to events? Kayleen, the Raptor ID Happy Hour was sponsored by Princeton University Press, as part of their celebration of the publication of the Crossley ID Guide: Raptors. As friends of PUP, we thought we would help publicize this event for those birders who might have read about it earlier in the month on the PUP Birds and Natural History Blog, http://blog.press.princeton.edu/category/birds-and-natural-history/, or on PUP’s Facebook page. I know, I often read about events well-publicized in advance, and say to myself, ‘I really want to do this,’ and then forget on the day of the event. Sometimes, even when I write it into my datebook! We thought, there will be birders tired after a long, hard week of work (and birding), who will come home and need a reminder about the Internet Happy Hour. You can read about additional events featuring the Raptors guide and its authors on the PUP blog, plus a free ebook with selections from the book. And, we will be reviewing it in the near future.